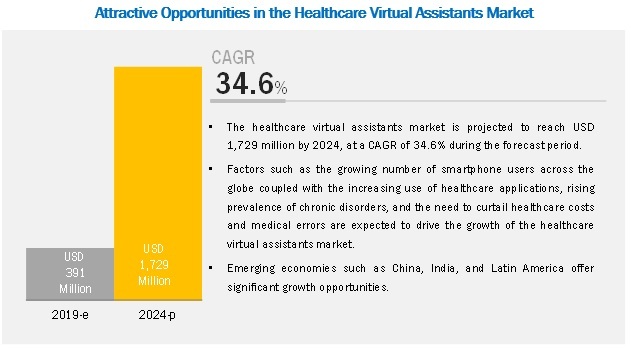 [159 Pages Report] The healthcare virtual assistants market is projected to reach USD 1,729 million by 2024 from USD 391 million in 2019, at a CAGR of 34.6%. Factors such as the growing number of smartphone users and the increasing use of healthcare applications, the growing demand for quality healthcare delivery, and the rising prevalence of chronic disorders are driving the growth of the healthcare virtual assistants market. The increasing focus on developing conversational virtual assistant tools and multi-language support in healthcare virtual assistant tools are also expected to provide growth opportunities for players in the market. Based on user interface, the automatic speech recognition segment is expected to grow at the highest CAGR during the forecast period. The automatic speech recognition segment is expected to witness the highest CAGR due to its increasing use in smart speakers. On the basis of product, the smart speakers segment is expected to witness the highest growth during the forecast period. The growth in this segment can be attributed to the increasing consumer preference for technologically advanced products. Smart speakers are multifunctional, fast, varied, and reliable solutions. This not only saves time but also offers increased comfort and greater convenience. Nuance is the leading player in the healthcare virtual assistants market. The company offers solutions and services to more than 500,000 clinics and 10,000 healthcare facilities worldwide to improve patient care and support clinical workflow. The company operates in more than 70 countries across the Americas, Europe, and Asia with a remarkable presence in the US, Australia, Belgium, Brazil, Canada, Germany, Hungary, Israel, Japan, and the UK. In 2018, Nuance launched Dragon Medical One, a universal cloud-based speech recognition platform in Canada to enable physicians to quickly and conveniently capture a patient’s complete story at the point of care. In 2018, Verint Systems and UCB, a biopharmaceutical company, introduced April, UCB’s PD Coach app that is equipped with a patented & conversational virtual health assistant. In 2018, eGain integrated eGain Solve with Amazon Connect, which enables connected and convenient customer experience across all touch points. In 2017, HealthTap opened an Asia Pacific hub office in Hamilton, New Zealand to connect New Zealanders with hospital clinicians and healthcare professionals from smartphones, tablets, and personal computers at home or on-the-go. What are the major end users of healthcare virtual assistants? What are the user interface areas of healthcare virtual assistants? Which are the major healthcare virtual assistant products? What is the global scenario of healthcare virtual assistants? The secondary research process involved the widespread use of secondary sources, directories, databases (such as Bloomberg Business, Factiva, and D&B Hoovers), white papers, annual reports, company house documents, investor presentations, and SEC filings of companies. Secondary research was used to identify and collect information useful for the extensive, technical, market-oriented, and commercial study of the healthcare virtual assistants market. It was also used to obtain important information about the key players and market classification & segmentation according to industry trends to the bottom-most level, and key developments related to market and technology perspectives. A database of the key industry leaders was also prepared using secondary research. In the primary research process, industry experts from both the supply and demand sides were interviewed to obtain qualitative and quantitative information for this report. Industry experts from the supply side include CEOs, vice presidents, marketing and sales directors, business development managers, technology and innovation directors of companies manufacturing healthcare virtual assistant products, key opinion leaders, and suppliers and distributors; whereas, industry experts from the demand side include researchers, biotechnologists, R&D heads, and related key personnel. The market size estimates and forecasts provided in this study are derived through a mix of the bottom-up approach (revenue share analysis of leading players) and top-down approach (assessment of utilization/adoption/penetration trends, by product, user interface, end user, and region). After arriving at the market size, the total healthcare virtual assistants market was divided into several segments and subsegments. To complete the overall market engineering process and arrive at the exact statistics for all segments and subsegments, the data triangulation and market breakdown procedures were employed, wherever applicable. Nuance Communications Inc. (US), Microsoft (US), Amazon (US), Infermedica (Poland), Sensly (US), eGain Corporation (US), Kognito Solutions LLC (US), Verint Systems Inc. (US), HealthTap Inc. (US), and Babylon Healthcare Services Ltd (UK).